FDOT plans on posting more than a dozen plaques with carefully written messages of hope on the top of the barriers on the side of the bridge. ST. PETERSBURG, Fla. — You may not know Tiffany Mills, but she is ready to know you. 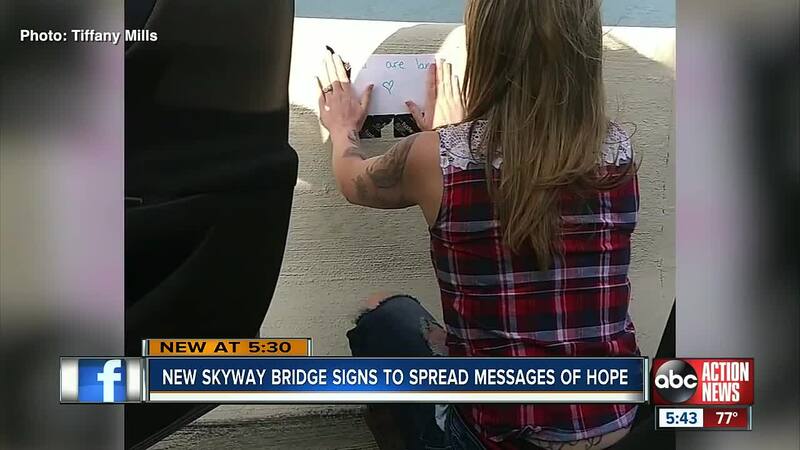 She and a friend made signs full of encouraging and motivating words, then taped them along the Skyway bridge last week. "Around 200. There were about 100 on each side northbound and southbound,” she said. "You are loved, you matter, this world is a better place with you in it,” she said, reading off some of the messages. Mills says she can’t bear the thought of someone feeling alone. She thinks a sign could be exactly what someone needs to get help if they're in a dark place. "Even if I’m not physically there to stop somebody, it’s something — a sign showing them you’re not alone, you can get through this, keep going it’s going to be okay,” she said. The signs were taken down just hours after she taped them up because it’s illegal to park on the side of the side of the bridge for anything other than an emergency. She says a Florida Highway Patrol officer kindly reminded them of this. While she was sad to hear the signs were taken down, she feels accomplished knowing the Florida Department of Transportation has a more permanent plan. FDOT plans on posting more than a dozen plaques with carefully written messages of hope on the top of the barriers on the side of the bridge. You won’t be able to see them from your car, so they don't distract drivers. "There are no words to describe that feeling. It was very surreal and I was very happy that they were putting up some type of signage to show people you are not alone,” Mills said. The plan for the plaques has been in the works for a while, after FDOT says they heard from folks all over the world. Mills says it’s clear by how many people have shared and commented on her post about the messages she taped, people in our community care about each other. "That’s really all I want. That’s it, that’s all I wanna do is help people,” she said. The plaques are going up sometime in May, 2019. If you or someone you know are struggling with thoughts of suicide, please call 1-800-273-TALK (8255).